Rockstar Games has released another Red Dead Redemption 2 gameplay trailer ahead of the cowboy sequel’s release later this month. It’s a similar format to previous trailers, offering both a look at the game’s action and open-world, and an explanation of the features heading to the game. 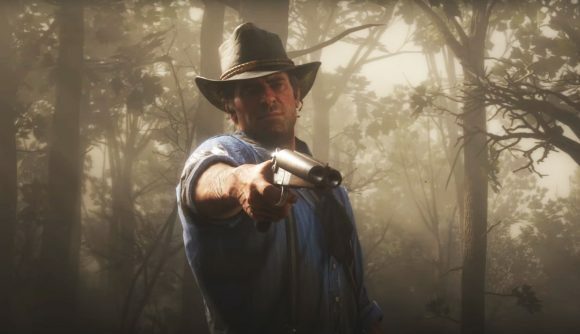 The trailer, which you can watch towards the bottom of this article, starts off strong, with main character Arthur Morgan throwing another cowboy off a train. The life-of-crime approach continues throughout, as the video shows off the many ‘revenue streams’ available to Arthur. Those range from large-scale bank heists to train robberies, petty larceny to loan sharking. If you don’t fancy all that, however, you can wander off and explore by yourself – although if you do so, you may have to deal with rival gangs. That said, there’s plenty to do to take yourself off the beaten tracks; the trailer shows hunting, herding, and even games of Texas Hold ‘Em to keep yourself entertained. All of your actions will have consequences though – get too mucky, and you’ll be shunned by polite society. Get too violent, and you’ll be remembered. As I said, you can watch the new trailer in the video below. For some reason, it doesn’t focus on the fact that Red Dead Redemption 2’s horse testicles shrink in the cold, but that’s the kind of content we’re committed to bringing you. The Red Dead Redemption 2 release date is October 26, but unfortunately that’s just for consoles. Rockstar has not, however, ruled out a PC version yet – expect the same kind of double-dipping, mini-remaster approach that we saw from Grand Theft Auto V when that eventually moved away from consoles, but be prepared to wait a long time for it.